Smiting a wealth of negative reviews from iniquitous TV critics -- including yours truly -- The Bible rose up and drove the History network to near-record ratings heights Sunday. Vikings, another original scripted series that received a far better reception from reviewers, also scored well while ranking as the No.1 TV attraction in its 9 p.m. (central) time slot among advertiser-prized 18-to-49-year-olds. 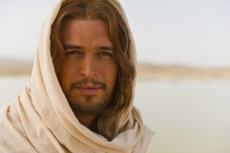 The Bible's 7 to 9 p.m. premiere averaged 13.1 million viewers while adding 1.7 million for the same night's repeat. Vikings drew 6.2 million viewers, with another 2.1 million for its encore telecast. The Bible, which will continue with two-hour chapters through Easter Sunday, couldn't quite match the initial ratings high for History's Hatfields & McCoys, which drew 13.9 million viewers for its first two-hour airing on May 28th. But Jesus hasn't even appeared yet, and won't come into full focus until Sunday, March 24th. The Crucifixion scenes are being held back until Easter. Hatfields & McCoys respectively drew 13.1 million and 14.3 million viewers for Parts 2 and 3. The Bible, which likewise attracted a predominantly older audience, has a solid shot to break those records. Vikings, billed by History as a series rather than a miniseries, still has eight hours to go and almost certainly will be renewed for a Season 2. Averaging a significantly higher percentage of 18-to-49-year-olds -- 2.5 million of its first telecast's 6.2 million -- Vikings may well be an overall more attractive and lucrative property for History. The success of The Bible and Vikings is yet another big headache for the Big Four broadcast networks, who once upon a time dominated Sunday nights with an array of big ticket movies and "Big Event" miniseries. AMC's Sunday night episodes of The Walking Dead already have been carving viewers away from ABC, CBS, NBC and Fox. The zombie-dominant series also draws more 18-to-49-year-olds than any prime-time series on any night. ABC and NBC both offered two-hour editions of new attractions Sunday night. But ABC's Red Widow (6.9 million total viewers) and NBC's All-Star Celebrity Apprentice (5.1 million) fell far short of the total audience for The Bible. And of all the Big Four networks' offerings, only CBS' 60 Minutes came close with 12 million viewers. ***Fox has given renewals for next season to two freshman series -- The Following and The Mindy Project -- and holdover comedies New Girl and Raising Hope. ***For the first time, NBC's America's Got Talent will have a fourth judge when it returns for Season 8 this summer. Heidi Klum has been named to joined fellow newcomer Mel B and incumbents Howie Mandel and Howard Stern. Sharon Osbourne left the show after last season. ***Jon Stewart will take a summer hiatus from The Daily Show, starting in June, to direct his first feature film. It's titled Rosewater, and is from his production company, Busboy Productions. Daily Show veteran John Oliver, who came aboard in 2006, will anchor in Stewart's absence during the eight weeks of original shows planned. The program otherwise is in reruns during the summer.